The area where the nose should have been was badly disfigured, as if a wild animal had bitten a chunk out of it. Hadi opened the canvas sack and took out the thing. In recent days he had spent hours looking for a fresh one like it, yet he was still uneasy handling it. It was a fresh nose, still coated in congealed, dark red blood. His hand trembling, he positioned it in the black hole in the corpse’s face. It was a perfect fit, as if the corpse had its own nose back. It’s only now that Hadi comes to his senses and realises that what he’s done is unlikely to be a good idea. However, before he can do anything about it, fate intervenes. After the life of a young security guard is taken by yet another suicide bomber, the young man’s soul drifts around looking for a body to rest in, and when he comes across Hadi’s collection of body parts, he makes it his new home. When the junk dealer awakes, he finds that the corpse has gone, but there’ll be plenty more before the story reaches its close. 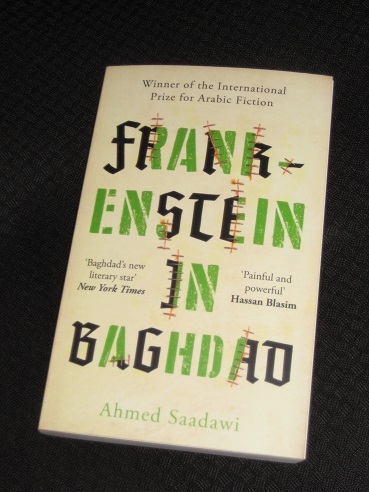 I’m sure I’m not the only reader to have been slightly hesitant to pick up Frankenstein in Baghdad. Zombie novels aren’t really my preferred genre, and I had my doubts as to how much I’d enjoy a story following a monster around the Iraqi capital. Of course, there’s far more to Saadawi’s work than that, though, and while the enigmatic Whatsitsname (as Hadi dubs him) is a focal point, the writer is just as interested in taking a wider view of Iraq’s post-invasion society and explaining that there’s far more to fear than a figure with a stitched-up face. The story follows several key characters apart from Hadi, including Elishva, a lonely widow who believes the creature is her long-missing son, and Mahmoud, a tenacious journalist investigating the appearance of Hadi’s creation. In the background, there’s a shadowy government force, the Tracking and Pursuit Department, which has expanded its limited brief to using astrologers to help predict when and where suicide bombers will strike. As the novel progresses, the department senses that a new series of gruesome murders are down to one ‘man’ alone – and they’re determined to track ‘him’ down. The centre of the story, though, is Whatsitsname, and through encounters with the creature’s creator and a recording it makes in an attempt to justify itself, we learn why it’s determined to track down and kill people. Each of the parts that make up his body is thirsting for revenge, and the creature will gain no peace until its murderers have been paid back in kind. However, each time this happens, the body part in question simply melts away, leaving Whatsitsname to replace it – which only adds to the list of people to take vengeance upon. The ‘monster’ is nothing less than a representative of the Iraqi people, and in a country where justice is hard to come by, you have to take it where you can. Unsurprisingly, there are plenty of people willing to throw their weight behind Whatitsname – faith is plural here, meaning there’s always room for one more saviour. Does it deserve to make the shortlist? Will it make the shortlist? It’s very possible that the judges will regard this more highly than I did, particularly for its depiction of people navigating a chaotic society. Hassan Blasim’s The Iraqi Christ took out the IFFP in 2014, and for me this is a far more impressive take on post-invasion Iraq. I’m not sure how well Saadawi’s novel will stand up to a second reading, but if I were a betting man, I could think of worse books to have a punt on for the shortlist. A little shaken, but otherwise unscathed, it’s time for us to leave Baghdad behind and head off to Paris, swapping signs of conflict for signs in general. A man has died, with foul play suspected, and only two people are up to the task of working out why: a grumpy policeman and… a linguistics professor? Just who is Tony, and what exactly is his Reading List? All posts (unless otherwise stated) remain the property of Tony Malone. Anyone wishing to use all or part of one of my posts should seek permission before doing so.